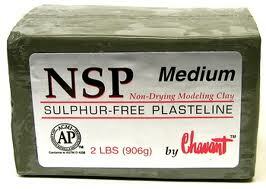 Chavant NSP, is for use when sulpher based plastelina is not desired. Sulpher can be detrimental to working with silicon molds. Priced per 2 pound block, medium consistency, green color only.